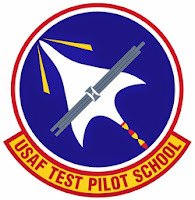 “Flight Test Pilots do not think about shows. 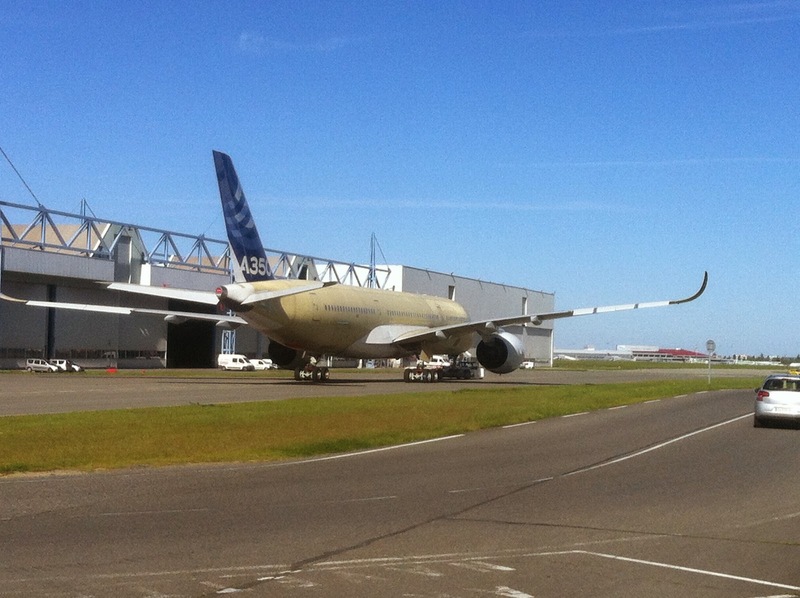 They fly when they are ready"
Before flying, the A350 must pass a series of ground tests. "No machine as complex can be perfect straight away," said Claude Lelaie, who took the A380 on its maiden flight in April/2005. 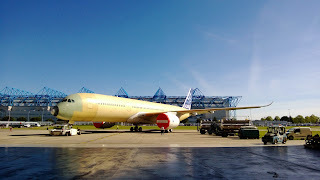 The timing of the equivalent first flight for the A350 will depend in part on when Lelaie's successors in the flight team agree to take the aircraft from the developers. That is a decision not even top managers can impose on the elite corps of pilots and flight test engineers who, with their own lives at stake, have final say over whether to accept delivery of the jet, just as though they were outside customers. "It is another world. 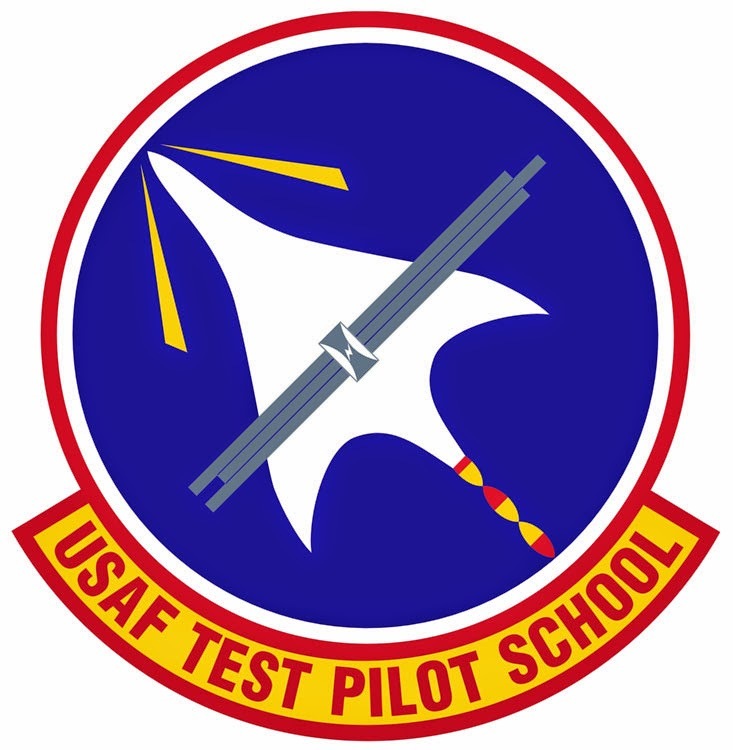 Flight Test Pilots do not think about shows. They fly when they are ready," said an industry executive. 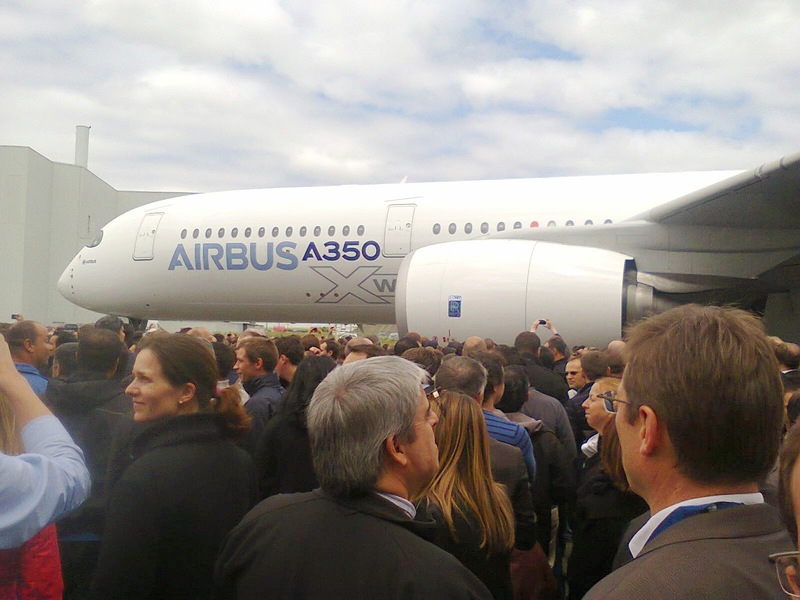 The A380 debut was delayed when crew rejected the double-decker plane until a landing-gear problem had been addressed. In a book last year, Lelaie described how a year of flight testing on the A380 was complicated by mistrust between pilots and management. Analysts say such tensions have eased, however. The handover to test crews could be near the end of May and a maiden flight two weeks later, but the schedule is tight. 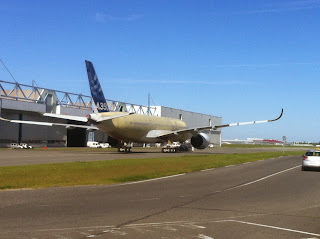 Singapore Airlines orders 30 A350-900 more and signs option for further 20 A350-1000s. 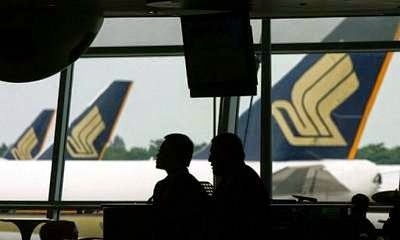 Singapore Airlines (SIA) has announced that it has signed an agreement to order up to 30 A350-900s plus options for a further 20 aircraft that could be selected between both A350-1000 or A350-900 when exercising the options. This is the 3rd order from Singapore Airlines for the A350 XWB with a total firm orders of 70 aircraft, excluding options. To date Airbus has recorded 616 firm orders for the A350 XWB from 34 customers worldwide. SIA wants to be the launch customer of the already-not-launched 787-10X. The order for large capacity medium-haul aircraft is a sign that SIA sees growth potential on routes within Asia Pacific and to the Middle East. 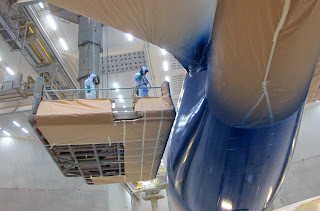 Fabrice Rémésy Head of Toulouse Paint Centre says “Green is Lean”. “By replacing 3 coats of coloured paint with a single one with a much higher pigment concentration, we achieve a reduction in our VOC (Volatile Organic Compounds) emissions into the atmosphere” said the Head of Toulouse Paint Centre. 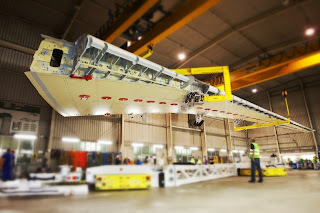 The A350 XWB 1g Wing Bend Test has been performed on the EW Static and Fatigue Wing Specimen in IABG facilities in Erding. This milestone marks the start of the EW test campaign and is the culmination of many months´ work. 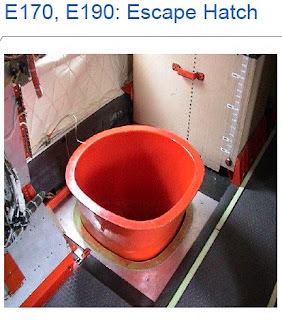 The EW Test is a combined static and fatigue test for a left hand wing box specifically testing the primary CFRP structure of the wing, as well as high load input zones such as Main Landing Gear and Pylon. The 1g Wing Bending Test is performed to demonstrate the safe operation of the high lift and flight control surfaces and systems during flight and ground conditions. It is the first of a series of tests involving the simulation of 1.5 service goals, incorporating maximum wing bending (Limit Load and Ultimate Load) at key points during the test campaign. The video of the test, which probably will be shared by Airbus in the future, shows the wing bended with the tip in a much higher position than the fuselage barrel. 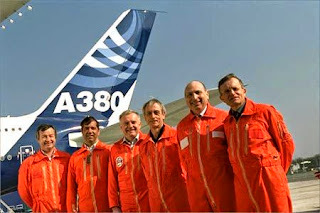 Peter Chandler will be the lead flight test pilot of the A350 MSN1 aircraft. He is not a newcomer… Peter Chandler has been an experimental test pilot with Airbus since joining the company in the summer of 2000. Prior to this appointment he worked for Virgin Atlantic Airways where he was a long-haul captain on Airbus A340s and also a project pilot representing the airline in various industry working groups, and in the early development of both the A340-600 and A380. 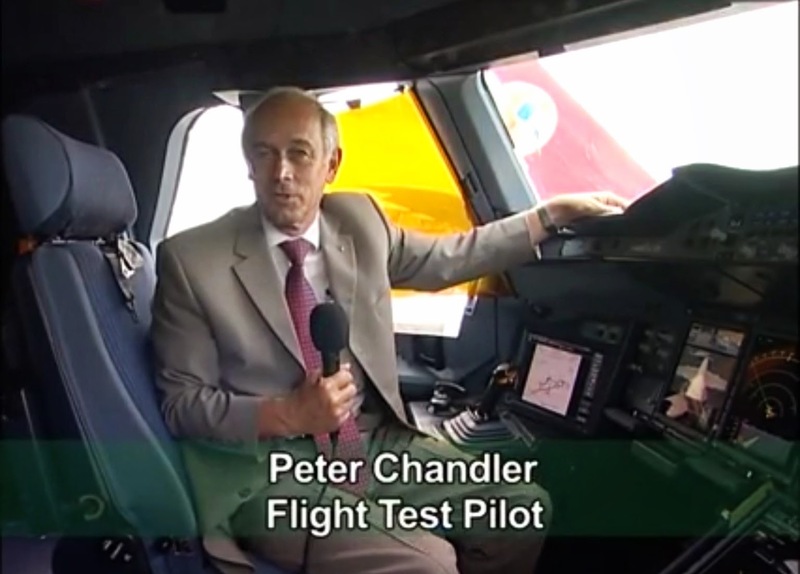 Peter Chandler flies all Airbus types from the A300 to the A380 and has been the Deputy Project Pilot for the A380. 10 years ago, he was heavily involved in all aspects of the A380’s cockpit and systems design and development, and now it will be the first time he is involved in a “first flight”. 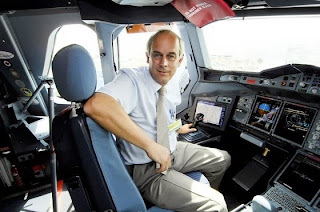 After being participating since April 2005 in the flight tests in the A380 MSN1, in 2008 he was nominated as the Head of flight-test pilots for Airbus civil aircraft. Peter Chandler was born in 1954 in England and flied in the Royal Air Force for 20 years as instructor and as test pilot after being trained in the famous USAF Test Pilot School in Edwards-California. Aviation Lease & Finance Co., known as Alafco, is a Kuwaiti aircraft leasing company that currently has 49 planes operating in its fleet. They will generally refrain from buying new airliners until it gets the first of 117 planes already on order in 4 years, Chairman Ahmad Al-Zabin said. “We need to slow down now or stop rather, until we see what the coming days tell us about the market, about our ability in placing these aircraft,” Al-Zabin said. Alafco aims to increase operating profit by 10% every year by boosting income from leases on the current fleet, Al-Zabin said. While the company has “good expectations” for the business, it prefers to move cautiously on orders, he said. 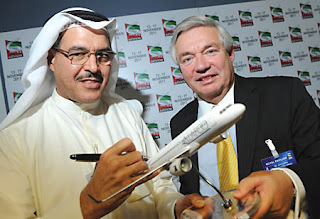 “The main aircraft we are interested in now is A320 and 737 new generation or -800,” Al-Zabin said. If a good business opportunity arises with a larger aircraft, the company may go ahead, he said. Besides the single-aisle planes, Alafco has 12 A350-900s on order from Airbus and also already found takers for half of those. 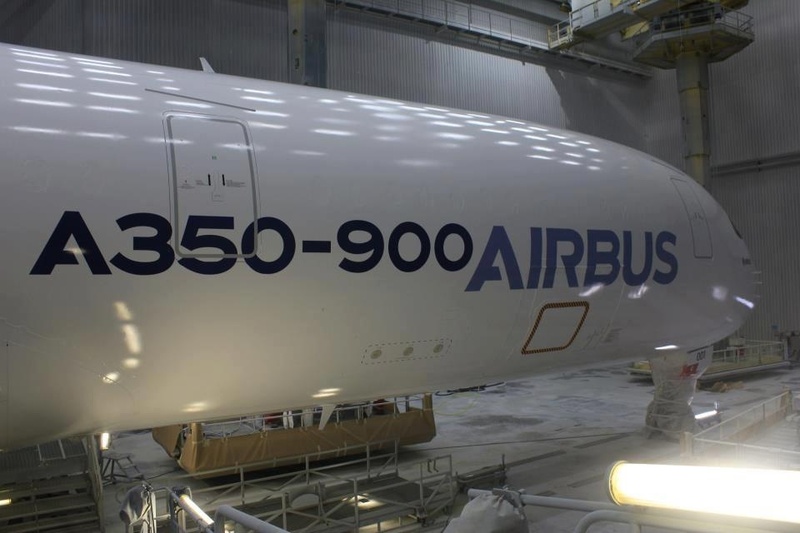 While Alafco has ordered A350-900s, it continues to monitor development of the -1000 version. “We study whatever comes up in the market for these aircraft. Things can always change but for the time being we’re happy with the 900s,” Al-Zabin said. Sri Lankan Airlines, without cash, is ordering 4 A350-900s ... and 6 A330-300s in the interim. Sri Lankan Airlines has signed a provisional deal with Airbus to buy 6 A330-300 and 4 A350-900 aircraft for delivery between 2014 and 2023. The airline, seeking to modernize its fleet to cut fuel costs, will opt for Rolls-Royce engines and use a lease-back arrangement to conserve cash, chief executive Kapila Chandrasena said in an interview. "The total cost altogether is going to be around USD$1.3 billion. But deliveries are progressively from 2014 to 2023 on a staggered basis," he said. The carrier signed a memorandum of understanding on the purchase with Airbus last Friday, he said. Sri Lankan Airlines now operates a 22-aircraft fleet including seven A320-200s, seven A330-300s, six A340-300s and two Twin Otters. Chandrasena said the national carrier needs to replace all six A340-300s with A330-300 aircraft and all seven A330-300s with A350-900s. 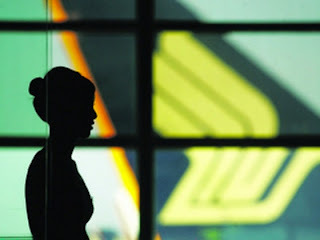 Chandrasena said the airlines considered offers by both Airbus and Boeing. "We looked at who is giving more value for us. 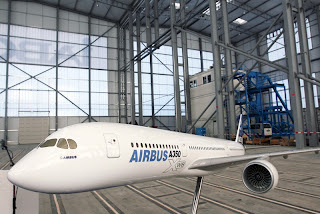 In that discussion, it was apparent that the Airbus offer of A330-300s in the interim and long-term A350-900 is much more favorable than the Boeing," he said. "Boeing did not have interim aircraft. They were only interested in the long-term offer, which was the 787." "We don't have cash," Chandrasena said. "So what we are doing is a sale and lease." Air Cruises is a company with 78 years that can be considered the world leader in evacuation systems with over 60% market share. 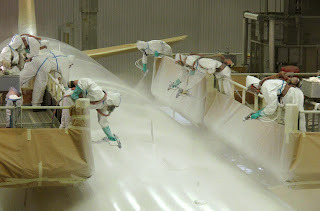 Since 1987, AirCruisers has been a subsidiary of the Zodiac Groupe of Paris. The merger provided synergy for both that strengthened both companies' positions in their respective markets. They invented the first inflatable evacuation slide and provide evacuation systems to Airbus for A320 family and to Boeing for almost all the models, including 787 in the picture below. 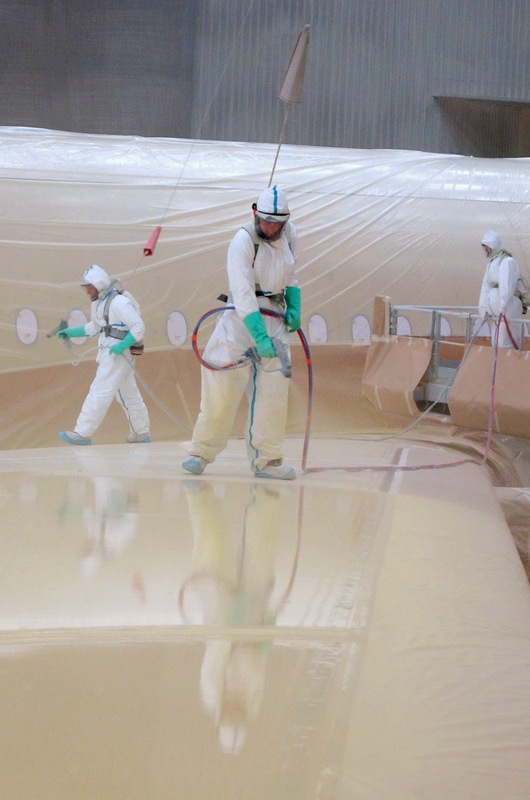 Air Cruisers offers a complete line of inflatable safety products: evacuation slides and slide rafts, life vests, life rafts and helicopter floats. They produced the first one-person life raft, the first inflatable life vests and the first vacuum packed inflatable life vest, and remains after 60 years of innovative ideas and experience, the industry standard for aviation inflatable safety technology. The future of the A350-800. Not abandoned but delayed as the successor to the A330. Boeing engaged in a public campaign to cast doubt on the viability of the -800. Airbus has poorly defended the airplane, and its efforts to switch customers to the -900 further casts doubt. But officials insist the -800 has a future. The question is, when? The current entry-into-service plan for the family is the A350-900 in the second half 2014; late 2016 for the A350-800 and 2017 for the A350-1000. 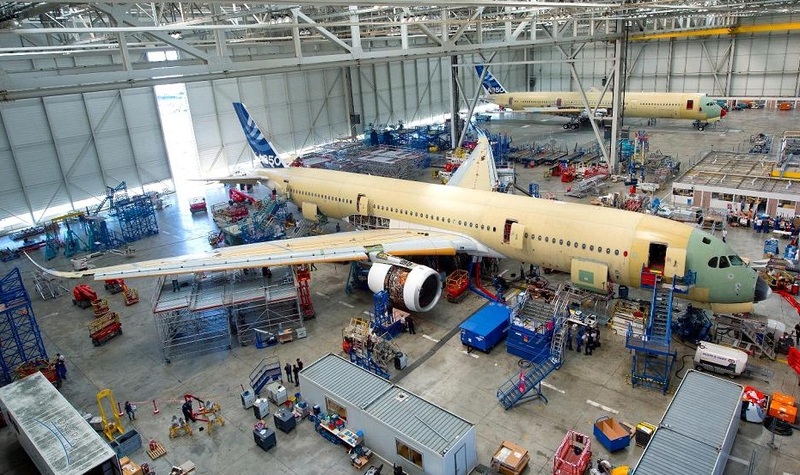 There are only two A350-800s scheduled for delivery in 2016, with the bulk in 2017, when the A350-1000 is due for delivery in reasonably sizable numbers. 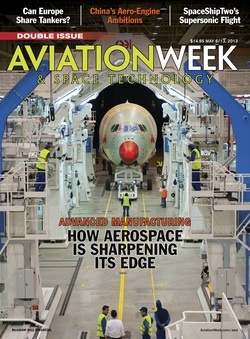 Leeham News were told from several sources that Airbus is switching customers from the smallest model to larger versions in part to de-risk the program. 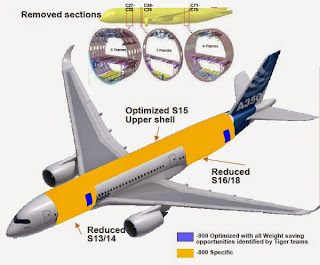 Schedule on the A350-900 is already tight and resources are focused on this sub-type. Switching customers relieves pressure on these limited resources. Another reason, expressed by Leahy: the A350-900 is more profitable for Airbus (though Airbus is offering incentives valued at “millions of dollars” to switch). 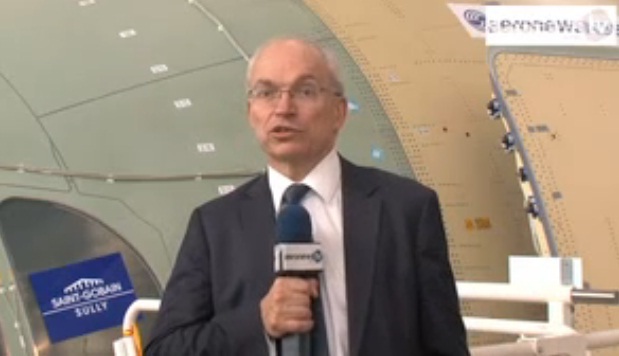 Leahy also says switching to the A350-900 gives customers earlier delivery slots. In Leeham News are not quite sure how, but this is what he said. Leeham News believes the increasing demand for the A350-1000 will prompt Airbus to re-sequence the EIS, moving the A350-800 from 2016/2017 to 2018. This will open slots in 2017 for the A350-1000 and ease integration pressure for Airbus. The A330 will be approaching its 30th year from EIS in 2024, and by then will reach the end of its natural life cycle, if not somewhat before. 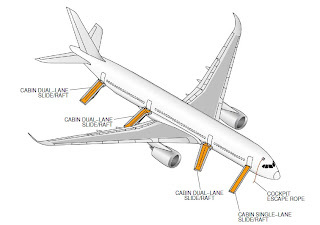 Airbus needs to come up with a solution to replace the A330. 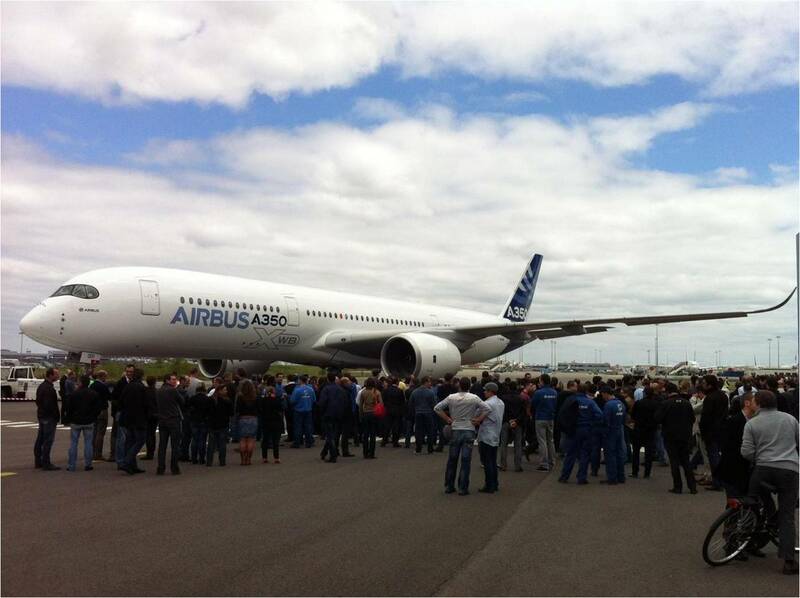 A350 XWB first flight-aircraft MSN1 could make Paris Air Show flyby but will not land in Le Bourget. The timescales of its previous airliner launches suggest Airbus could be ready to fly the aircraft in mid-June, depending on weather and ground trials, giving pilots a narrow time window to test the plane's basic characteristics in flight before the June 17-23 air show. With just a few hours in the air, industry sources say it is unlikely that the first completed A350 XWB, rolled out of the Airbus paint shop only last week, will actually land at the show. Test aircraft require special permissions to land and only some airports are certified for those purposes. 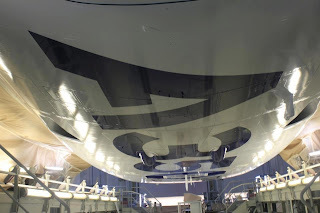 Airbus has painted -for the first time in it´s history- the A350 logo on the belly fairing. Such belly markings are typically used for branding in air show flyby. 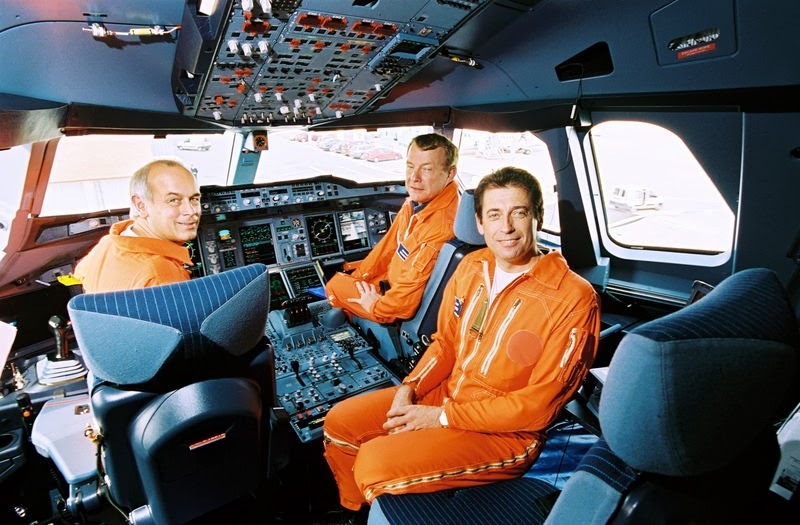 "If everything goes well, you can do a quick check of cruise performance even on the first flight," said Claude Lelaie, who was head of flight testing at Airbus before he retired. "Everyone is usually anxious to have a very preliminary idea of performance, and especially fuel consumption," he said. For the first aircraft that will start soon the flight tests campaign with the target of EIS in 2014, it has been installed a special emergency evacuation system. 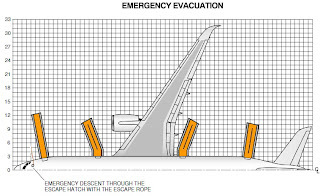 Located in the forward cargo door, it will allow the flight crew to get safely to the ground in case of emergency. Test pilots and engineers will wear lifejackets, helmets and parachutes in some flights with the first “heavy instrumented aircraft” in order to test the extreme performance and all type of limit situations that might occur in the life of the plane. Why an additional exit for flight tests? 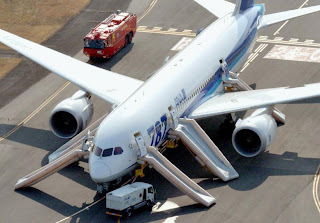 In case something goes terribly wrong and you decide it is time for the test crew to take a silk ride, you need to depressurize the aircraft to get the doors open. No time for that. 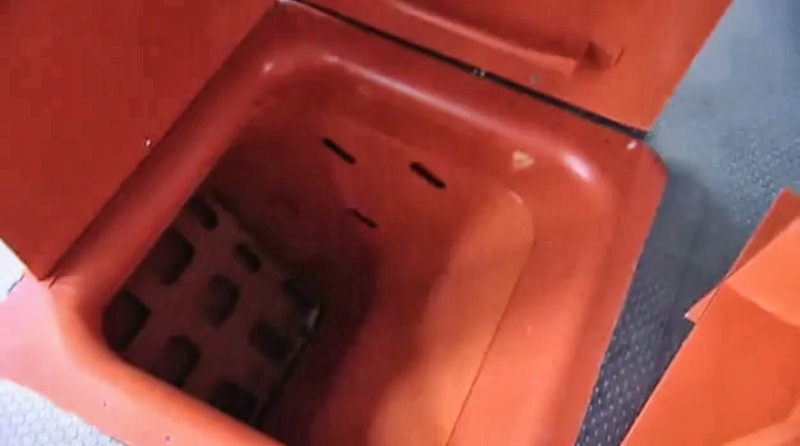 So the alternative is this emergency exit with a hatch whose cover needed to be blown away with some sort of pyrotechnic-explosive for the crew to escape. The emergency evacuation hatch is fired by pyrotechnic candles in the cockpit and in the flight test engineer station. The crew could go to the door and jump into the red tube with their parachutes to leave the aircraft and get safely to the ground. 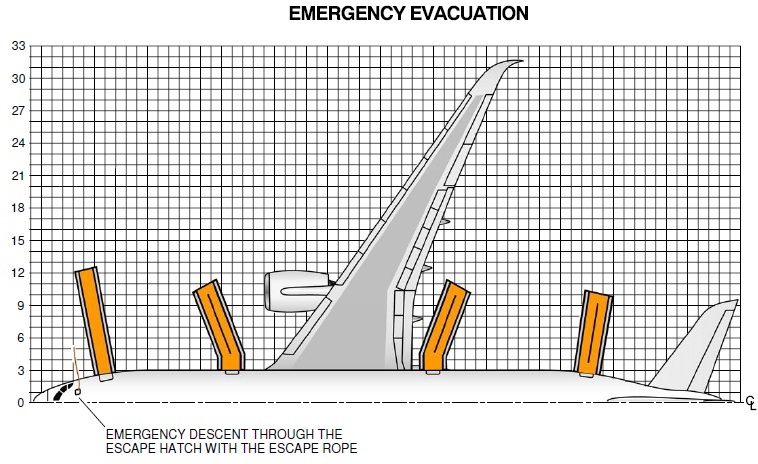 The location of this emergency exit in the main cargo door was the same in the A380 first test-aircraft and makes sense because it is easier to change the cargo door than some fuselage panels if the escape hatch mechanism attached to it. Other manufacturer like Embraer have similar systems in their bigger aircraft, although this is not the unique configuration available. 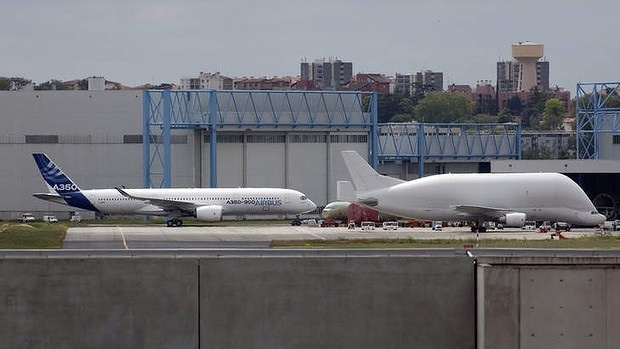 Finally, It has been published the picture of the MSN1 (with engines) and MSN3 in the same hangar (C63) when they met each other on the 3rd week of April. The MSN3 was moved out of the FAL on its wheels and spent a few days in the C63 hangar next to its twin MSN1 to undergo lightning tests that are required for First Flight Clearance. After those tests, MSN3 returned to the FAL. Meanwhile, MSN1 remained for some days in the C63 hangar preparing Ground Vibration Tests and trying to finish the FTI- Flight Test Installation. The MSN3 has a very similar configuration as MSN1, only with some FTI differences. 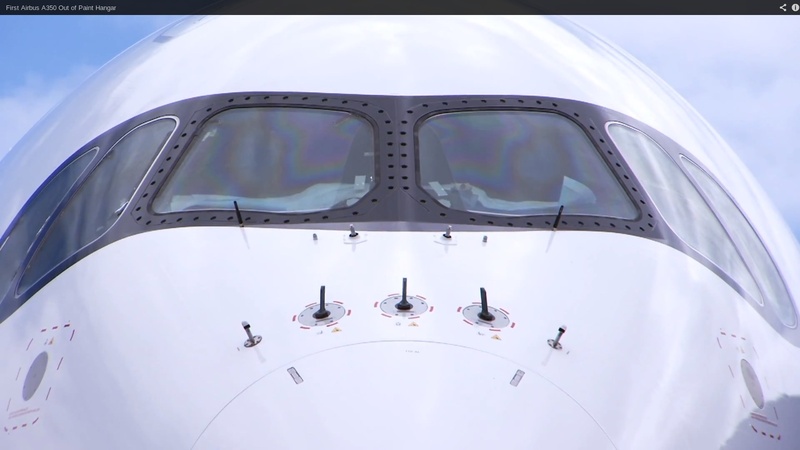 A350 XWB First Flight date depends on previous on-ground tests as for example the “rejected takeoff at high speed” test. 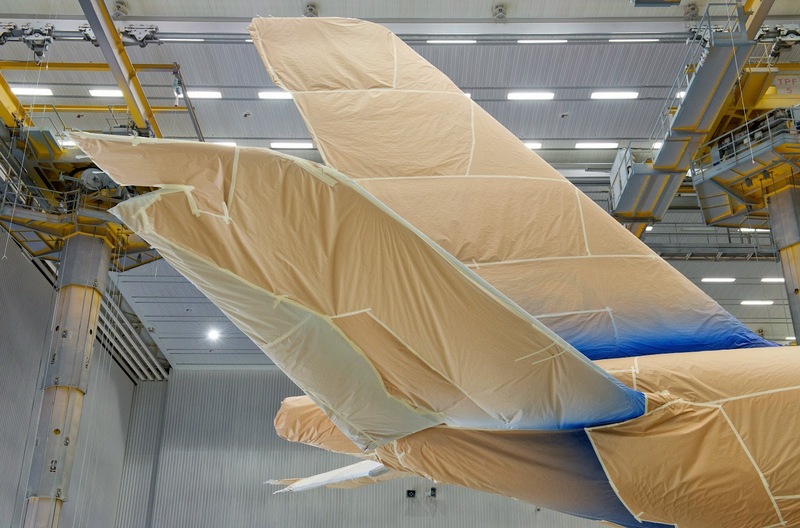 Having been painted, the MSN001 will shortly be turned over to pilots and flight-test engineers, who will monitor it from the first flight through more than 12 months of rigorous trials culminating in certification and service entry. Tests to be done before the aircraft gets airborne include running engines through controlled cycles, taxiing at low and high speeds, and a so-called rejected takeoff at high velocity to check that brakes, spoilers and thrust reversers all work properly to bring the aircraft to a controlled standstill. Depending on these tests, the First Flight date will be fixed but could be the week before Paris Air Show (starting on 17/June). 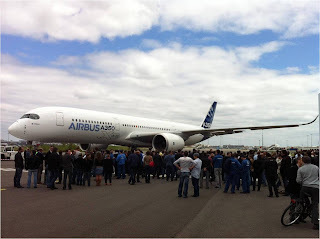 With a live-video signal that will be follow in all Airbus sites in big video-walls and in streaming by internet all around the world, the event could have a massive media coverage converting this “Toulouse Air Show” in the unofficial start of the Paris Air Show. The take off -around 10 am- will be follow by many people in the other side of the fence of the Toulouse Airport and the flight could take between 4 and 5 hours. Next step in the MSN001; start of engines … and the typical white smoke. The start of engines by the test-crew will take place in coming days. With the fire & emergency crews on the stand by, the A350 XWB will “come to live”. The white smoke that we will see is caused by a protective lay of oil burning off. Testing and monitoring the engines will take two days. 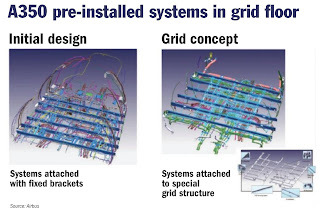 Systems pre-installed in support/floor grids to reduce assy lead time in the FAL. 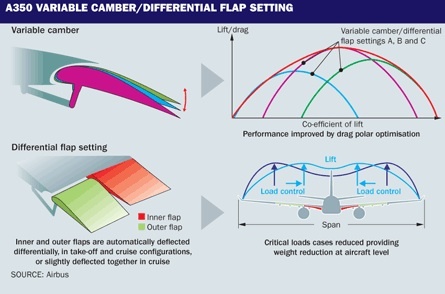 Airbus and Boeing have adopted similar methods of pre-equipping large modules in the 787 and the A350 to reduce lead time and recurring costs. An example of this is the decision to pre-install systems such as electrical harnesses and other cables and piping above the avionics bay using a secondary support grid structure, rather than attaching them to crossbeams with fixed brackets in the traditional manner. “Lead time has been reduced by 80% on the floor grid in the nose above the avionics bay. Before, it was impossible to produce as a module so we started to go into the architecture. As a result, we developed a secondary structure we can pre-equip,” says Gralfs, Airbus VP of overall physical design, who adds that the integration of the unit lies on the critical path. All of the A350’s metal parts — including aluminum seat rails and a mix of aluminum, aluminum/lithium alloy and titanium for lower frames and passenger cabin structural floor grid beams — do double duty. 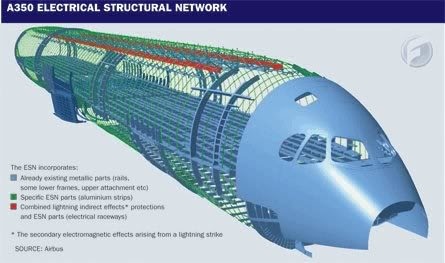 Each part has a structural function, and it also forms part of the overall electrical structure network (ESN) within the aircraft. 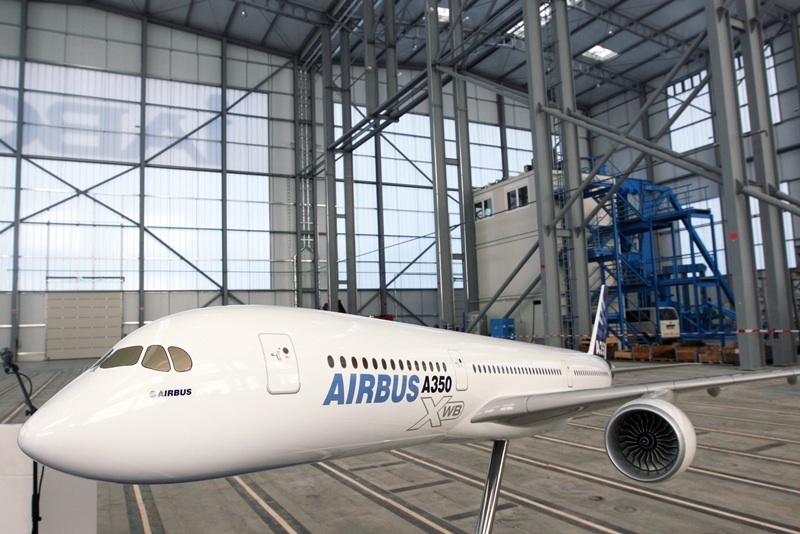 A350 XWB equipped with a new oxygen system, which delivers oxygen based on a person’s breathing cycle. Risky? Oxygen cylinders are vulnerable to explosion if exposed to fire or impact damage. Oxygen facilitates the spread of fire or increases its intensity. The vulnerability of onboard bulk oxygen to post crash or in-flight fire is dependant upon its location within the aircraft. The risk of a major explosion is dependant on the quantity stored and whether it is stored in one place or distributed around the aircraft. 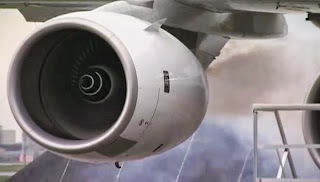 Airbus A350XWB is to be equipped with a new type of oxygen system, the BE Aerospace Pulse® system, which delivers oxygen based on a person’s breathing cycle and has oxygen stored in small vessels, one at each PSU. This type of system may be relatively well protected from crash impact damage compared with much larger bulk oxygen cylinders that are often located beneath the cabin floor, but might pose a greater overall risk in a cabin fire, albeit with a smaller explosion. The Pulse passenger oxygen system weight can be reduced by up to 450 pounds. Pulse also requires less maintenance while supporting various aircraft mission profiles and seating reconfigurations. It eliminates the need for rigid pipe, providing mission flexibility. 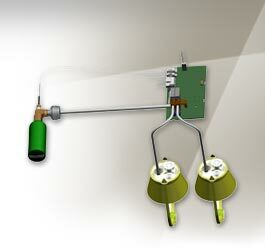 To conserve energy, the Pulse System is not powered during typical flights and activates immediately if required. In addition, its built-in microprocessors are designed to improve reliability with minimal preventative maintenance required. 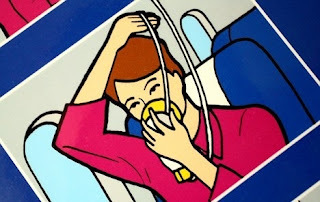 EASA recommends a research to be carried out to establish the explosion risks presented by different passenger emergency oxygen storage systems when subjected to cabin fire or post crash impact. However, it is likely that this method of oxygen storage would present a greater risk of explosion in a fire than chemical oxygen systems. 787 has the same new type of oxygen system. 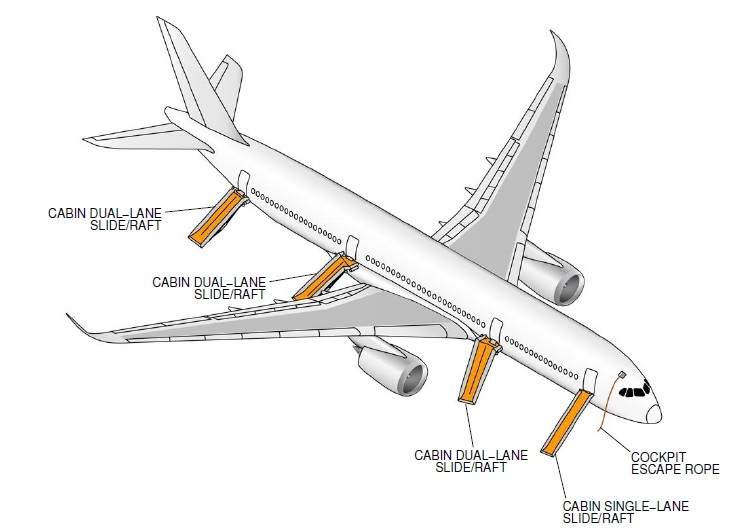 Small oxygen storage vessels located at each PSU in the A350 XWB and in the B787 present a greater risk than large (centralised) storage vessels? One month countdown to the next milestone; Airbus wants the A350 XWB flying by the 50th Paris AirShow to get a credibility boost against Boeing rival. 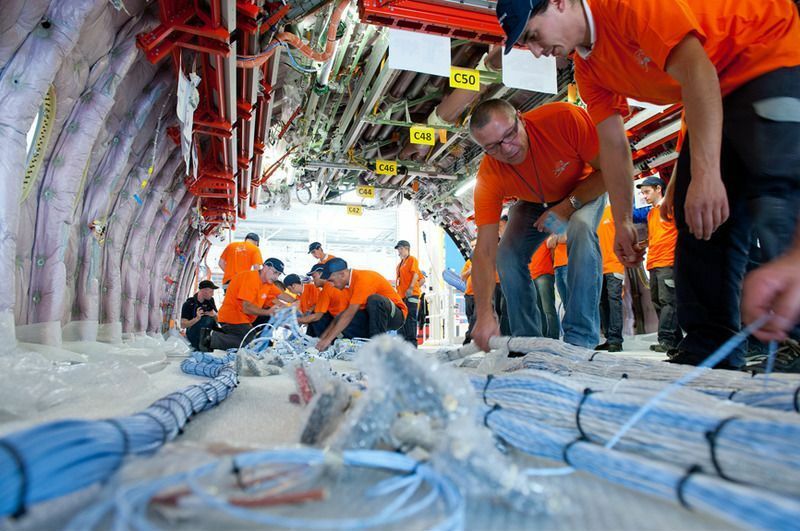 Airbus engineers are working 13-hour days to get the company’s latest A350 plane off the ground in time to scoop the headlines at next month’s Paris air show. A flight around the year’s biggest aviation expo, starting June 17, would let Airbus steal the limelight from Boeing, which aims to use the event to spur orders for an updated 777 and revitalize the 787 program hit by a months-long grounding. Getting the wide-body A350 aloft would repeat Airbus’s splash at the last Paris show in 2011, which the European manufacturer dominated with $44 billion worth of orders for the A320neo. 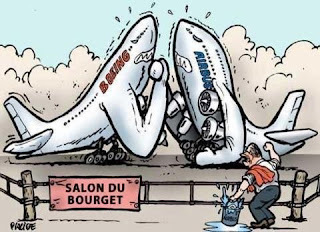 While Boeing hit back at the 2012 Farnborough jamboree in England with a welter of deals for the 737 Max, the 787 troubles has taken the gloss off its French prospects. Airbus’s first new jet since the A380 superjumbo won’t need to appear in Paris to be the top talking point, with a maiden takeoff from the Toulouse production site likely to be enough to outshine Boeing. 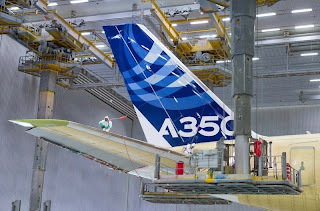 The chances of a flight during the event rose when the first operational plane emerged from the paint shop yesterday, replete with an Airbus logo and A350 name on its white fuselage. EADS Chief Financial Officer Harald Wilhelm called the A350 program “challenging” today; “The important thing is that it’s a mature first flight” he said. With the A350 due to enter commercial service with Qatar Airlines Ltd. by the end of next year, achieving a timely first flight would be a coup for Airbus after the 787 made its initial takeoff two years late and began deliveries three years overdue. Airbus is in a position to land a blow against Boeing in Paris after taking a conservative approach in developing the A350 that sought to avoid the pitfalls of previous projects. “The biggest lessons we can draw from the past is that we need to move from one step to the other on these big programs, without rushing,” Airbus CEO Fabrice Bregier said at last summer’s Farnborough show. Since then, progress has been sufficiently brisk for A350 engineers to view mid-June as a target for its first flight, even if the official goal remains a less specific “mid-2013,” according to Bregier. 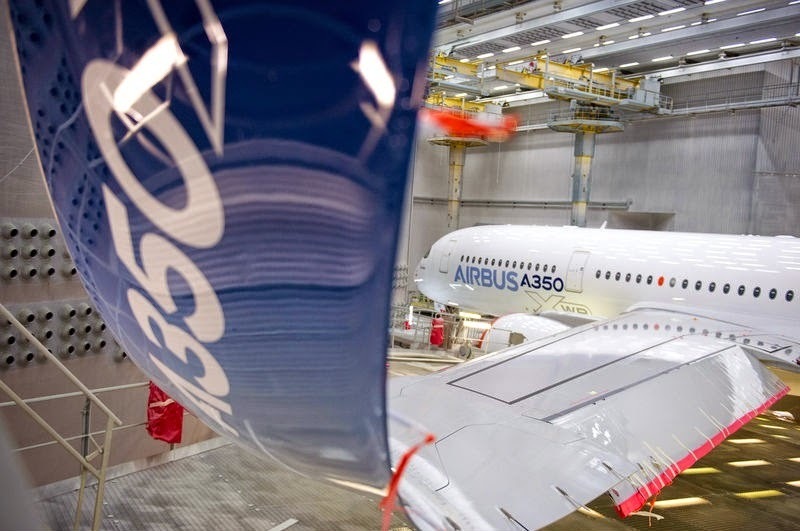 The A350’s Head of Program, Didier Evrard, is leading efforts to get the plane airborne, arriving at the factory before 7 a.m. and leaving after 8 p.m.
An A350 flight by mid-June could have a snowball effect for Airbus, building sales momentum for the A350-1000 variant due to begin deliveries in 2017, even as Boeing seeks to drum up orders for the competing 777X, according to Teal Group’s Aboulafia. 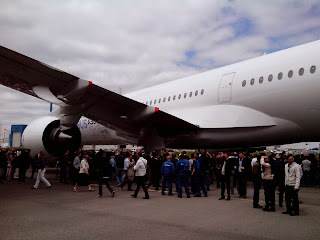 “Having the A350 fly by the Paris air show would be great from a prestige point of view. But they’ll only do it if they’re really comfortable. They’re not going to be pushed.” Said Nick Cunningham, an analyst at Agency Partners in London who has followed the aviation industry for 30 years.